"As flag officers who have been honored to serve our country in war and peace, just as Eisenhower was, we call on our elected political leaders to honor him properly by mandating a new, fair, and public competition to design his memorial," the letter states. "Instead of the normal fair and open competition of designs, the appointed commission delivered a design that, after many years and much public money spent, still does not have public or Congressional support," the letter states. "As a result, progress toward the memorial is at a standstill." "Ike’s legacy demands—and our country requires—a memorial that unites rather than divides us," the letter states. "It's no surprise that our military leaders see the folly in the design," said Justin Shubow, president of the National Civic Art Society and a leading critic of the Gehry design. "Eisenhower was someone who didn't crow about his achievements. He didn't wear his medals on his uniform, and he chose to be buried in the same $80 casket provided to the common soldier. It is wholly inappropriate to commemorate him with a grandiose design." Other veterans have expressed support for the design. 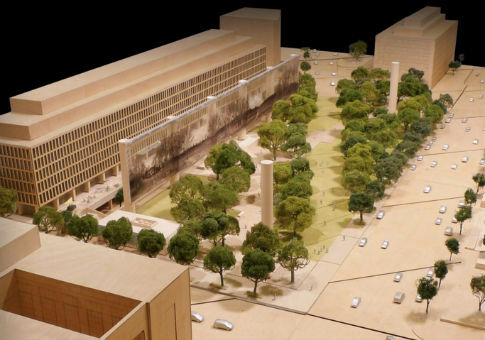 The Veterans of Foreign Wars passed a resolution urging Congress "to reinstate funding and build the National Eisenhower Memorial." Bob Dole, the former Senate majority leader and World War II veteran, is helping raise money for the memorial. In the absence of congressional funding, the Eisenhower commission has tried to raise construction funds through private donations. The group’s private fundraising has lagged far behind the goals it set, the Free Beacon has reported.